Authorities in the United Arab Emirates have continued to restrict freedom of expression. 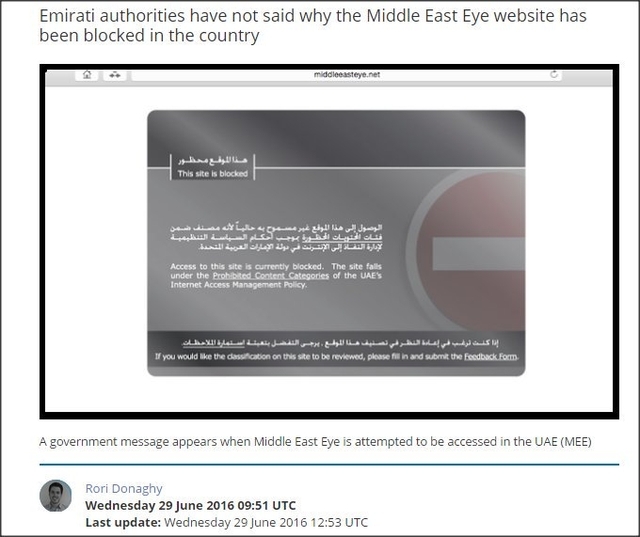 On 29th June, according to reports from IFEX, the website of the Middle East Eye, an online news organisation, was blocked by Emirati authorities. The Middle East Eye had reported widely on the UAE’s involvement in the war in Yemen as well as on human rights violations. This is the latest in a number of websites reporting on human rights issues that have been blocked by the Telecommunications Regulatory Authority. In January 2015, the website of the Gulf Centre for Human Rights was blocked in the UAE. British-Australian citizen Scott Richards was arrested in Dubai on 28th July after sharing a Facebook post promoting a charity supporting Afghan refugees. He was detained for almost a month before being charged under Decree No (9) of 2015, which regulates fundraising and charitable donations in Dubai. The legislation prohibits the collection of donations or advertising of fundraising campaigns without first obtaining prior written approval from the Islamic Affairs and Charitable Activities Department. On 23rd August Richards was released on conditional bail and his hearing is due to be held in September. If convicted, he could face up to a year in prison as well as a fine of US$30,000. Human rights defenders and political prisoners continue to be held in Emirati jails. Among these is human rights defender Osama Al-Najjar, an online activist and human rights defender. According to the Gulf Centre for Human Rights, in August the United Arab Emirates’ State Security Apparatus (SSA) made an arbitrary decision not to release Al-Najjar despite the fact that he had served three quarters of his sentence. Under the UAE's Punitive Installations Law, prisoners who have served three quarters of their sentence are entitled to be released. Al-Najjar had been sentenced to three years in prison on 25th November 2014 and fined 500,000 Emirati Dirham (approximately US$136,100). He had been charged with belonging to banned group Al-Islah (Reform and Social Guidance Association), offending and instigating hatred against the state via Twitter and spreading lies about the torture of his father, Hossain Al-Najjar. His father is one of the prisoners in the group known as the UAE94, and is currently serving an 11-year jail term for his human rights activities.